M. La Rosa, Managing Variability in Process-Aware Information Systems. Queensland University of Technology, Brisbane, Australia. April 2009. M. Dumas, M. La Rosa, J. Mendling, H.A. 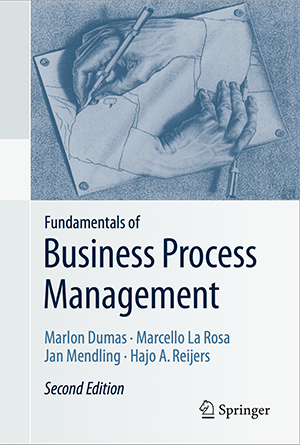 Reijers, Fundamentals of Business Process Management, 2nd edition, Springer, March 2018. M. Dumas, M. La Rosa, J. Mendling, H.A. Reijers, Fundamentals of Business Process Management, Springer, March 2013. M. La Rosa, P. Loos, O. Pastor, M. Reichert (guest editors), Special Issue on Best papers from Business Process Management 2016, Information Systems, Vol. 78, 2018. M. La Rosa, P. Loos, O. Pastor (editors), Proceedings of the 14th Int. Conference on Business Process Management, Vol. 9850, LNCS, Springer, 2016. 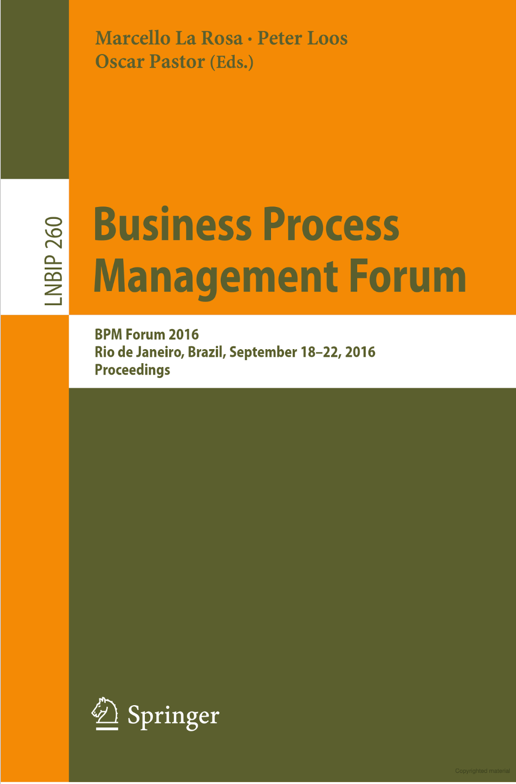 M. La Rosa, P. Loos, O. Pastor (editors), Proceedings of the Business Process Management Forum 2016, Vol. 260, LNBIP, Springer, 2016. W.M.P. van der Aalst, M. La Rosa, F.M. Santoro (guest editors), Special Issue on BPM "Use Cases", Business & Information Systems Engineering, Vol. 58 No. 1, 2016. 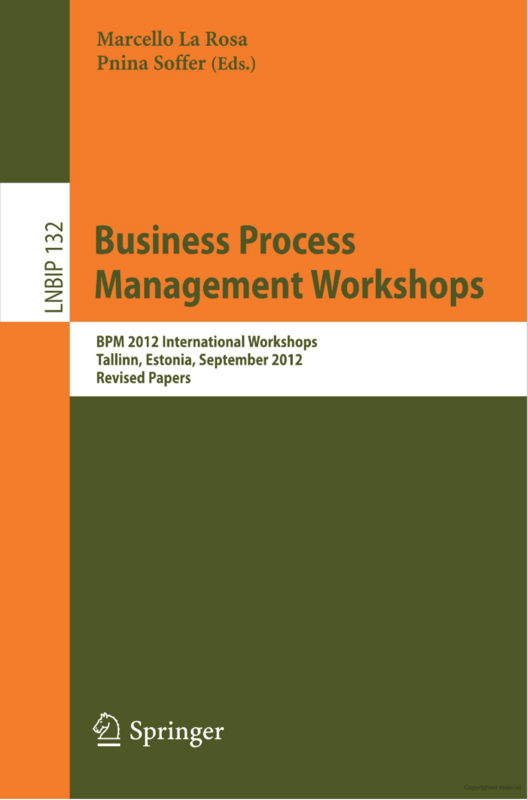 M. La Rosa, P. Soffer (guest editors), Special Issue on Best Papers from Business Process Management Workshops - BPM 2012, Information Systems and e-Business Management, Vol. 13 No. 1, Springer, 2015. L. Heloisa Thom, M. Fantinato, M. La Rosa, R. Dijkman (editors), Proceedings of the 5th Int. Workshop on Process Model Collections: Management and Reuse (PMC-MR), in conjunction with the 12th Int. Conference on Business Process Management, Eindhoven, The Netherlands, 2014. L. Heloisa Thom, M. Fantinato, M. La Rosa, R. Dijkman (editors), Proceedings of the 4th Int. Workshop on Process Model Collections: Management and Reuse (PMC-MR), in conjunction with the 11th Int. Conference on Business Process Management, Beijing, China, 2013. 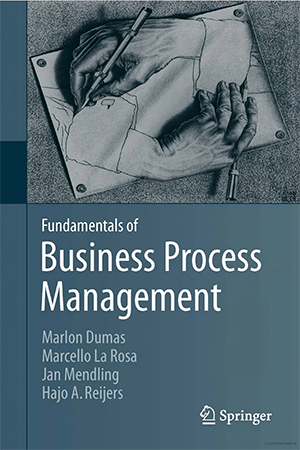 M. La Rosa, P. Soffer (editors), Business Process Management Workshops - BPM 2012, LNBIP 132, Springer, 2013. H. Reijers, M. La Rosa, R. Dijkman (guest editors), Special Issue on Managing Large Collections of Business Process Models, Computers in Industry, Vol. 63 No. 2, 2012. H. Reijers, M. La Rosa, R. Dijkman (editors), Proceedings of the 1st Int. Workshop on Process Model Collections (PMC), in conjunction with the 9th Int. Conference on Business Process Management, Clermont-Ferrand, France, 2011. M. La Rosa (editor), Proceedings of the Business Process Management Demonstration Track 2010, Vol. 615 CEUR, 2010. H. Reijers, M. La Rosa, R. Dijkman (editors), Proceedings of the 1st Int. Workshop "Process in the Large" (IW-PL), in conjunction with the 7th Int. Conference on Business Process Management. Stevens Institute of Technology, Hoboken, USA, 2010. A. Armas-Cervantes, M. La Rosa, M. Dumas, A. Abderrahmane, Local Concurrency Detection in Business Process Event Logs, ACM Transactions on Internet Technology (ACM ToIT), 2018 (forthcoming). A. Augusto, R. Conforti, M. Dumas, M. La Rosa, F.M. Maggi, A. Marrella, M. Mecella, A. Soo, Automated Discovery of Process Models from Event Logs: Review and Benchmark, IEEE Transactions on Knowledge & Data Engineering (IEEE TKDE), 2018 (forthcoming). A. Augusto, R. Conforti, M. Dumas, M. La Rosa, A. Polyvyanyy, Split Miner: Automated Discovery of Accurate and Simple Business Process Models from Event Logs, Knowledge and Information Systems (KAIS), 2018 (forthcoming). M. La Rosa, P. Loos, O. Pastor, M. Reichert: Editorial special issue: Selected papers of BPM 2016. Information Systems, Vol. 78, pp. 81-82, 2018. J. Mendling, I. Weber, W.M.P. van der Aalst, J. vom Brocke, C. Cabanillas, F. Daniel, S. Debois, C. Di Ciccio, M. Dumas, S. Dustdar, A. Gal, L. Garcia-Banuelos, G. Governatori, R. Hull, M. La Rosa, H. Leopold, F. Leymann, J. Recker, M. Reichert, H.A. Reijers, S. Rinderle-Ma, A. Rogge-Solti, M. Rosemann, S. Schulte, M.P. Singh, T. Slaats, M. Staples, B. Weber, M. Weidlich, M. Weske, X. Xu, L. Zhu, Blockchains for Business Process Management - Challenges and Opportunities, ACM Transactions on Management Information Systems (ACM TMIS), Vol. 9 No. 1, 2018. A. Augusto, R. Conforti, M. Dumas, M. La Rosa, G. Bruno, Automated Discovery of Structured Process Models from Event Logs: The Discover-and-Structure Approach, Data & Knowledge Engineering (DKE), 2018. L. Garcia-Banuelos, N.R.T.P. van Beest, M. Dumas, M. La Rosa, W. Mertens, Complete and Interpretable Conformance Checking of Business Processes, IEEE Transactions on Software Engineering (IEEE TSE), Vol. 44 No. 3, 2018. A. Maaradji, M. Dumas, M. La Rosa, A. Ostovar, Detecting Sudden and Gradual Drifts in Business Processes Based on Event Logs, IEEE Transactions on Knowledge & Data Engineering (IEEE TKDE), Vol. 29 No. 10, 2017. M. La Rosa, W.M.P. van der Aalst, M. Dumas, F.P. Milani. Business Process Variability Modeling: A Survey. ACM Computing Surveys (ACM CSUR), Vol. 50 No. 1, 2017. R. Conforti, M. La Rosa, A.H.M. ter Hofstede, Filtering out Infrequent Behavior from Business Process Event Logs. IEEE Transactions on Knowledge & Data Engineering (IEEE TKDE), Vol. 29 No. 10, 2017. R. Conforti, M. Dumas, L. Garcia-Banuelos, M. La Rosa, BPMN Miner: Automated discovery of BPMN process models with hierarchical structure. Information Systems, Vo. 56, 2016. M. La Rosa, M. Dumas, C. Ekanayake, L. Garcia-Baneulos, J. Recker, A.H.M. ter Hofstede, Detecting Approximate Clones in Business Process Model Repositories. Information Systems, Vol. 49, 2015. M. La Rosa, P. Soffer, Special issue on best papers from the "BPM 2012" workshops (editorial). Information Systems and e-Business Management, Vol. 13 No. 1, Springer, 2015. R. Conforti, M. de Leoni, M. La Rosa, W.M.P. van der Aalst, A.H.M. ter Hofstede. A Recommendation System for Predicting Risks across Multiple Business Process Instances. Decision Support Systems (DSS), Vol. 69, 2015. A. Polyvyanyy, M. La Rosa, C. Ouyang, A.H.M. ter Hofstede. Untanglings: A Novel Approach to Analyzing Concurrent Systems. Formal Aspects of Concurrency (FAOC), 2015 (forthcoming - online since 13 Jan. 2015). L. Garcia-Banuelos, M. Dumas, M. La Rosa, J. De Weerdt, C.C. Ekanayake. Controlled Automated Discovery of Collections of Business Process Models. Information Systems, Vol. 46, 2014. S. Suriadi, B. Weiss, A. Winkelmann, A.H.M. ter Hofstede, M. Adams, R. Conforti, C. Fidge, M. La Rosa, C. Ouyang, M. Rosemann, A. Pika, M.T. Wynn. Current Research in Risk-Aware Business Process Management - Overview, Comparison, and Gap Analysis. Communications of the Association for Information Systems, Vol 34 No. 1, 2014. H. Leopold, J. Mendling, H.A. Reijers, M. La Rosa. Simplifying Process Model Abstraction: Techniques for Generating Process model Names. Information Systems, Vol. 39, 2014. R. Conforti, M. La Rosa, G. Fortino, A.H.M. ter Hofstede, J. Recker, M. Adams. Real-Time Risk Monitoring in Business Processes: A Sensor-based Approach. Journal of Systems and Software, Vol. 86 No. 11, 2013. T. Jin, J. Wang, N. Wu, M. La Rosa and A.H.M. ter Hofstede. Efficient Querying of Large Process Model Repositories. Computers in Industry, Vol. 64 No. 1, 2013. M. Dumas, L. Garcia-Banuelos, M. La Rosa, R. Uba. Fast Detection of Exact Clones in Repositories of Business Process Models. Information Systems, Vol. 38 No. 4, 2013. M. La Rosa, M. Dumas, R. Uba and R. Dijkman, Business Process Model Merging: An Approach to Business Process Consolidation, ACM Transactions on Software Engineering and Methodology, Vol 22. No. 2, 2013. J. Mendling, L. Sanchez-Gonzalez, F. Garcia, M. La Rosa. Thresholds for Error Probability Measures of Business Process Models. Journal of Systems and Software, Vol. 85 No. 5, 2012. R. Dijkman, M. La Rosa, H. Reijers, Managing Large Collections of Business Process Models - Current Techniques and Challenges, Computers in Industry, Vol. 63 No. 2, 2012. J. Recker, M. La Rosa. Understanding User Differences in Open Source Workflow Management System Usage Intentions. Information Systems, Vo. 37 No. 3, 2012. W.M.P. van der Aalst, N. Lohmann and M. La Rosa. Ensuring Correctness During Process Configuration via Partner Synthesis. Information Systems, Vol. 37 No. 6, 2012. M. La Rosa, P. Wohed, J. Mendling, A.H.M. ter Hofstede, H. Reijers and W.M.P. van der Aalst. Managing Process Model Complexity via Abstract Syntax Modifications. IEEE Transactions on Industrial Informatics, Vol. 7. No. 4, 2011. M. La Rosa, A.H.M. ter Hofstede, P. Wohed, H. Reijers, J. Mendling, W.M.P. van der Aalst, Managing Process Model Complexity via Concrete Syntax Modifications. IEEE Transactions on Industrial Informatics, Vol. 7 No. 2, 2011. M. Adams, A.H.M. ter hofstede, M. La Rosa, Open Source Software for Workflow Management: The Case of YAWL. In IEEE Software - Impact, Vol. 28 No. 3, May/June 2011. M. La Rosa, H.A. Reijers, W.M.P. van der Aalst, R. Dijkman, J. Mendling, M. Dumas, Marlon and L. Garcia-Banuelos, APROMORE: An Advanced Process Model Repository. In Expert Systems with Applications, Vol. 38 Issue 6, 2011. M. La Rosa, M. Dumas, A.H.M. ter Hofstede and J. Mendling, Configurable Multi-Perspective Business Process Models. In Information Systems, Vol. 36 No. 2, 2011. S. Balko, A.H.M. ter Hofstede, A. Barros, M. La Rosa and M. Adams, Business Process Extensibility. In Enterprise Modelling and Information Systems Architectures - special issue EMISA09 Best Papers, Vol. 5 No. 3, 2010. W.M.P. van der Aalst, M. Dumas, F. Gottschalk, A.H.M. ter Hofstede, M. La Rosa, J. Mendling, Preserving Correctness During Business Process Model Configuration. In Formal Aspects of Computing, Vol. 22 No. 3-4, 2010. M. La Rosa, W.M.P. van der Aalst, M. Dumas and A.H.M. ter Hofstede. Questionnaire-based Variability Modeling for System Configuration, Software and Systems Modeling, Vol. 8 No. 2, 2009. C. Ouyang, M. La Rosa, A.H.M. ter Hofstede, M. Dumas and K. Shortland, Towards Web-Scale Workflows for Film Production, IEEE Internet Computing, Vol. 12, No. 5, Sep/Oct 2008. F. Gottschalk, W.M.P. van der Aalst, M.H. Jansen-Vullers and M. La Rosa. Configurable Workflow Models, International Journal of Cooperative Information Systems, Vol. 17 No. 2, June 2008. C. Ouyang, K. Wang, A.H.M. ter Hofstede, M. La Rosa, M. Rosemann, K. Shortland and D. Court, Camera, Set, Action: Process Innovation for Film and TV Production, Cultural Science, Vol. 1 No. 2, 2008. A. Augusto, A. Armas-Cervantes, R. Conforti, M. Dumas, M. La Rosa, D. Reissner, Abstract-and-Compare: A Family of Scalable Precision Measures for Automated Process Discovery, In Proceedings of the Int. Conference on Business Process Management (BPM2018), accepted: 7 June 2018. H. Nguyen, M. Dumas, M. La Rosa, A.H.M. ter Hofstede: Multi-perspective Comparison of Business Process Variants Based on Event Logs, In Proceedings of the Int. Conference on Conceptual Modeling (ER2018), 2018. V. Leno, A. Armas-Cervantes, M. Dumas, M. La Rosa, Discoverying Process Maps from Event Streams, In Proceedings of the Int. Conference on Software and System Process (ICSSP2018), 2018. S.J. Zelst, M.F. Sani, A. Ostovar, R. Conforti, M. La Rosa, Filtering Spurious Events from Event Streams of Business Processes. In Proceedings of the Int. Conference on Advanced Information Systems Engineering (CAiSE2018), 2018. A. Armas-Cervantes, M. Dumas, L. Garcia-Banuelos, M. La Rosa, and N.R.T.P. van Beest, Interactive and Incremental Business Process Model Repair. In Proceedings of the Int. Conference on Cooperative Information Systems (CoopIS2017), 2017. D. Reissner, R. Conforti, M. Dumas, M. La Rosa, A. Armas-Cervantes, Scalable conformance checking of business processes. In Proceedings of the Int. Conference on Cooperative Information Systems (CoopIS2017), 2017. A. Augusto, R. Conforti, M. Dumas, M. La Rosa, Split Miner: Discoverying Accurate and Simple Process Models from Event Logs. In Proceeding of the IEEE International Conference on Data Mining (ICDM2017), accepted 17 Aug 2017. A. Augusto, R. Conforti, M. Dumas, M. La Rosa, G. Bruno. Automated Discovery of Structured Process Models: Discover Structured vs. Discover and Structure. In Proceeedings of the 35th International Conference on Conceptual Modeling (ER2016), accepted 15 Jun 2016. A. Ostovar, A. Maaradji, M. La Rosa, A.H.M. ter Hofstede, B. van Dongen. Detecting Drift from Event Streams of Unpredictable Business Processes. In Proceeedings of the 35th International Conference on Conceptual Modeling (ER2016), accepted 15 Jun 2016. I. Verenich, M. Dumas, M. La Rosa, F.M. Maggi, C. Di Francescomarino. Minimizing Overprocessing Waste in Business Processes via Predictive Activity Ordering. In Proceedings of the 28th International Conference on Advanced Information Systems Engineering (CAISE2016), accepted 17 Feb 2016. H. Nguyen, M. Dumas, A.H.M. ter Hofstede, M. La Rosa, F.M. Maggi. Business Process Performance Mining with Staged Process Flows. In Proceedings of the 28th International Conference on Advanced Information Systems Engineering (CAISE2016), accepted 17 Feb 2016. L. Garcia-Banuelos, N.R.T.P. van Beest, M. Dumas, M. La Rosa, Business Process Conformance Checking Based on Event Structures. 27th Nordic Workshop on Programming Theory (NWPT), Reykjavik University, Iceland, 2015. I. Verenich, M. Dumas, M. La Rosa, F.M. Maggi, C. Di Francescomarino. Complex Symbolic Sequence Clustering and Multiple Classifiers for Predictive Process Monitoring. In Proceedings of the BPM Workshops 2015, to appear. A. Maaradji, M. Dumas, M. La Rosa, A. Ostovar, Fast and accurate business process drift detection. In Proceedings of the 13th International Conference on Business Process Management (BPM), Innsbruck, Austria. LNCS Vol. 9253, pp. 406-422, Springer, 2015. N.R.T.P. van Beest, M. Dumas-Menijvar, L. Garcia-Banuelos, M. La Rosa, Log delta analysis: Interpretable differencing of business process event logs. In Proceedings of the 13th International Conference on Business Process Management (BPM), Innsbruck, Austria. LNCS Vol. 9253, pp. 386-405, Springer, 2015. H. Nguyen, M. Dumas, M. La Rosa, F.M. Maggi, S. Suriadi. Mining Business Process Deviance: A Quest for Accuracy. In Proceedings of the 22th International Conference on Coopearive Information Systems (CoopIS), Amantea, Italy. LNCS Vol. 8841, pp. 436-445, Springer, 2014. R. Conforti, M. Dumas, L. Garcia-Banuelos, M. La Rosa. Beyond Tasks and Gateways: Discovering BPMN Models with Subprocesses, Boundary Events and Multi-Instance Markers. In Proceedings of the 12th Internation Conference on Business Process Management (BPM), Eindhoven, The Netherlands. LNCS Vol. 8659, pp. 101-117, Springer, 2014. A. Polyvyanyy, M. Weidlich, R. Conforti, M. La Rosa, A.H.M. ter Hofstede. The 4C Spectrum of Fundamental Behavioral Relations for Concurrent Systems. In Proceedings of the 35th International Conference on Application and Theory of Petri Nets and Concurrency (Petri Nets), Tunis, Tunisia. LNCS Vol. 8489, pp. 220-232, Springer, 2014. A. Polyvyanyy, M. La Rosa, A.H.M. ter Hofstede. Indexing and Efficient Instance-based Retrieval of Process Models Using Untanglings. In Proceedings of the 26th International Conference on Advanced Information Systems Engineering (CAiSE), Tessalonike, Greece. LNCS Vol. 8484, Springer, pp. 439-456, Springer, 2014. C. Ekanayake, M. Dumas, L. Garcia-Banuelos, M. La Rosa. Slice, mine and dice: complexity-aware automated discovery of business process models. In Proceedings of the 11th International Conference on Business Process Management (BPM), Beijing, China. LNCS 8094, pp. 49-64, Springer, 2013. R. Conforti, M. La Rosa, G. Fortino. Process Monitoring Using Sensors in YAWL. In Proceedings of the YAWL Symposium, CEUR 982, pp. 49-55, CEUR, 2013. R. Conforti, M. La Rosa, A.H.M. ter Hofstede, G. Fortino, M. de Leoni, W.M.P. van der Aalst, M. Adams. A Software Framework for Risk-Aware Business Process Management. In Proceedings of the CAiSE Forum, CEUR 998, pp. 130-137, CEUR, 2013. R. Conforti, M. de Leoni, M. La Rosa, W.M.P. van der Aalst. Supporting Risk-Informed Decisions during Business Process Execution. In Proceedings of the 25th International Conference on Advanced Information Systems Engineering (CAiSE), Valencia, Spain. LNCS 7908, pp. 116-132, Springer, 2013. J.C.A.M. Buijs, M. La Rosa, H.A. Reijers, B.F. van Dongen, W.M.P. van der Aalst. Improving Business Process Models using Observed Behavior. In Post-proceedings of the 2nd International Symposium on Data-driven Process Discovery and Analysis (SIMPDA), Campione d'Italia, Italy. LNBIB 162, pp. 44-59, Springer, 2013. R. Conforti, A.H.M. ter Hofstede, M. La Rosa, M.J. Adams. Automated Risk Mitigation in Business Processes. In Proceedings of the 20th International Conference on Coopearive Information Systems (CoopIS), Rome, Italy. LNCS Vol. 7566, pp. 212-231, Springer, 2012. C. Ekanayake, M. Dumas, L. Garcia-Banuelos, M. La Rosa, A.H.M. ter Hofstede. Approximate Clone Detection in Repositories of Business Process Models. In Proceedings of the 10th International Conference on Business Process Management (BPM), Tallinn, Estonia. LNCS Vol. 7481, pp. 302-318, Springer, 2012. M. Dumas, M. La Rosa, J. Mendling, R. Maesaku, H.A. Reijers, N. Semenenko. Understanding Business Process Models: The Costs and Benefits of Structuredness. In Proceedings of the 24th International Conference on Advanced Information Systems Engineering (CAiSE), Gdańsk, Poland. LNCS Vol. 7328, pp. 31-46, Springer, 2012. R. Conforti, G. Fortino, M. La Rosa, A.H.M. ter Hofstede. History-Aware, Real-Time Risk Detection in Business Processes. In Proceedings of the 19th International Conference on Cooperative Information Systems (CoopIS), Crete, Greece. LNCS Vol. 7044, pp. 100-118, Springer, 2011. C.C. Ekanayake, M. La Rosa, A.H.M. ter Hofstede, M.-C. Fauvet. Fragment-based Version Management for Repositories of Business Process Models. In Proceedings of the 19th International Conference on Cooperative Information Systems (CoopIS), Crete, Greece. LNCS Vol. 7044, pp. 20-37, Springer, 2011. W.M.P. van der Aalst et al. (including M. La Rosa). Process Mining Manifesto. In Proceedings of the 7th International Workshop on Business Process Intelligence (BPI), Clermond-Ferrand, France. LNBIP Vol. 99, pp. 169-194, Springer 2012. M. Gambini, M. La Rosa, S. Migliorini and A.H.M. ter Hofstede. Automated Error Correction in Business Process Models. In Proceedings of the 9th International Conference on Business Process Management (BPM), Clermond-Ferrand, France. LNCS Vol. 6896, pp. 148-165, Springer, 2011. K. van Hee, M. La Rosa, Z. Liu and N. Sidorova. Discovering Characteristics of Stochastic Collections of Process Models. In Proceedings of the 9th International Conference on Business Process Management (BPM), Clermond-Ferrand, France. LNCS Vol. 6896, pp. 298-312, Springer, 2011. R. Uba, M. Dumas, L. Garcia-Banuelos and M. La Rosa. Clone Detection in Repositories of Business Process Models. In Proceedings of the 9th International Conference on Business Process Management (BPM), Clermond-Ferrand, France. LNCS Vol. 6896, pp. 248-264, Springer, 2011. M. La Rosa, M. Dumas, R. Uba and R. Dijkman, Merging Business Process Models. In Proceedings of the 18th International Conference on Cooperative Information Systems (CoopIS), Creete, Greece. LNCS Vol. 6426, pp. 96-113, Springer, 2010. T. Jin, J. Wang, N. Wu, M. La Rosa and A.H.M. ter Hofstede. Efficient and Accurate Retrieval of Business Process Models through Indexing (Short Paper). In Proceedings of the 18th International Conference on Cooperative Information Systems (CoopIS), Crete, Greece. LNCS Vol. 6426, pp. 402-409, Springer, 2010. W.M.P. van der Aalst, N. Lohmann, M. La Rosa and J. Xu. Correctness Ensuring Process Configuration: An Approach Based on Partner Synthesis. In Proceedings of the 8th International Conference on Business Process Management (BPM), Hoboken, New Jersey. LNCS Vol. 6336, pp. 95-111, Springer, 2010. S. Balko, A.H.M. ter Hofstede, A. Barros, M. La Rosa and M. Adams, Controlled Flexibility and Lifecycle Management of Business Processes through Extensibility. In Proceedings of the 3rd International Workshop on Enterprise Modelling and Information Systems Architectures (EMISA'09), Ulm, Germany. LNI, P-152, GI, 2009. F. Gottschalk, T.A.C. Wagemakers, M.H. Jansen-Vullers, W.M.P. van der Aalst and M. La Rosa, Configurable Process Models: Experiences from a Municipality Case Study. In Proceedings of the 21th International Conference on Advanced Information Systems Engineering (CAiSE), Amsterdam, The Netherlands. LNCS 5565, pp. 486-500, Springer, 2009. M. La Rosa, J. Mendling, Domain-driven Process Adaptation in Emergency Scenarios (Invited paper). In Proceedings of the 1st International Workshop on Process Management for Highly Dynamic and Pervasive Scenarios (PM4HDPS), Milan, Italy. LNBIP 17, pp. 280–287, Springer, 2009. M. La Rosa, M. Dumas, A.H.M. ter Hofstede, J. Mendling, F. Gottschalk, Beyond Control-Flow: Extending Business Process Configuration to Roles and Objects. In Proceedings of the 27th International Conference on Conceptual Modeling (ER), Barcelona, Spain. LNCS 5231, pp. 199–215, Springer, 2008. W.M.P. van der Aalst, M. Dumas, F. Gottschalk, A.H.M. ter Hofstede, M. La Rosa, J. Mendling, Correctness-Preserving Configuration of Business Process Models. In Proceedings of Fundamental Approaches to Software Engineering (FASE), Budapest, Hungary. LNCS 4961, pp. 46–61, Springer, 2008. C. Ouyang, A.H.M. ter Hofstede, M. La Rosa, M. Rosemann, K. Shortland and D. Court, Camera, Set, Action: Automating Film Production via Business Process Management. In Proceedings of the International Conference “Creating Value: Between Commerce and Commons”, Brisbane, Australia, 2008. M. La Rosa, A.H.M. ter Hofstede, M. Rosemann and K. Shortland, Bringing Process to Post Production. In Proceedings of the International Conference “Creating Value: Between Commerce and Commons”, Brisbane, Australia, 2008. M. La Rosa, F. Gottschalk, M. Dumas and W.M.P. van der Aalst. Linking Domain Models and Process Models for Reference Model Configuration. In Proceedings of the 10th International Workshop on Reference Modeling (RM) at BPM 2007, Brisbane, Australia. LNCS 4928, pp. 417–430, Springer, 2008. M. La Rosa, J. Lux, S. Seidel, M. Dumas and A.H.M. ter Hofstede. Questionnaire-driven Configuration of Reference Process Models. In Proceedings of the 19th International Conference on Advanced Information Systems Engineering (CAiSE), Trondheim, Norway. LNCS 4495, pp. 424–438, Springer, 2007. G. Bruno, G. Bruno and M. La Rosa. On Collaborations and Choreographies. In Proceedings of the 1st International Workshop on Technologies for Collaborative Business Process Management (TCoB) at ICEIS 2006, pp. 3-12, INSTICC Press, 2006. G. Bruno and M. La Rosa. From collaboration models to BPEL processes through service models. In Proceedings of the 1st International Workshop on Web Service Choreography and Orchestration for Business Process Management at BPM 2005, Nancy, France. LNCS 3812, pp. 75-88, Springer, 2006. W.M.P. van der Aalst, M. La Rosa, A.H.M. ter Hofstede, M.T. Wynn, Liquid Process Model Collections. In D. Gianni, A. D'Ambrogio, A. Tolk (eds.) Modeling and Simulation-based Systems Engineering Handbook, Taylor & Francis Group, 2014. T. Kohlborn and M. La Rosa, SOA Efforts. In A. Barros, D. Oberle (eds.) Handbook of Service Description – USDL and its Methods. Springer, 2012. M. Adams, M. Dumas, M. La Rosa, The Architecture (Chapter VII). In A.H.M. ter Hofstede, W.M.P. van der Aalst, N. Russell, M. Adams (eds.) Modern Business Process Automation: YAWL and its Support Environment. Springer, 2009. S. Clemens, M. La Rosa, A.H.M. ter Hofstede, The Design Environment (Chapter VIII). In A.H.M. ter Hofstede, W.M.P. van der Aalst, N. Russell, M. Adams (eds.) Modern Business Process Automation: YAWL and its Support Environment. Springer, 2009. F. Gottschalk, M. La Rosa, Process Configuration (Chapter XVIII). In A.H.M. ter Hofstede, W.M.P. van der Aalst, N. Russell, M. Adams (eds.) Modern Business Process Automation: YAWL and its Support Environment. Springer, 2009. M. La Rosa, S. Clemens, A.H.M. ter Hofstede, The Order Fulfilment Process Model (Appendix A1). In A.H.M. ter Hofstede, W.M.P. van der Aalst, N. Russell, M. Adams (eds.) Modern Business Process Automation: YAWL and its Support Environment. Springer, 2009. M. La Rosa, M. Dumas, A.H.M. ter Hofstede, Modelling Business Process Variability for Design-Time Configuration (Chapter IX). In J. Cardoso, W.M.P. van der Aalst (editors), Handbook of Research on Business Process Modeling, IDEA Group – Information Science Reference, 2009. J.-H. Sewing, M. Rosemann, M. Dumas and M. La Rosa, Assessing The Potential Impact Of Web Services On Business Processes (Chapter XI). In I. Lee (editor), E-Business Models, Services, and Communications - Advances in E-Business Research Series (Vol. 2, 2007). IDEA Group – Information Science Reference, 2007. G. Bruno and M. La Rosa, Collaboration based on Web Services, In G. Putnik. M. M. Cunha (editors), Encyclopedia of Networked and Virtual Organizations, IDEA Group – Information Science Reference, 2007. C. Ouyang, W.M.P. van der Aalst, M. Dumas, A.H.M. ter Hofstede and M. La Rosa. Service-Oriented Processes: An Introduction to BPEL (Chapter VIII). In J. Cardoso (editor), Semantic Web Services: Theory, tools and Applications. IDEA Group – Information Science Reference, 2006. F. Fornari, M. La Rosa, A. Polini, B. Re, F. Tiezzi, Checking Business Process Correctness in Apromore, In Proceedings of the CAiSE Forum 2018, LNBIP, Springer, 2018 (accepted: 7 Apr 2018). I. Verenich, S. Moskovski, S. Raboczi, M. Dumas, M. La Rosa, F.M. Maggi, Predictive Process Monitoring in Apromore, In Proceedings of the CAiSE Forum 2018, LNBIP, Springer, 2018 (accepted: 7 Apr 2018). I. Verenich, K. Jorbina, A. Rozumnyi, C. Di Francescomarino, M. Dumas, F.M. Maggi, M. La Rosa, C. Ghidini and S. Raboczi, Nirdizati: A Web-Based Tool for Predictive Process Monitoring. In Proceedings of the Demo Track of the 15th International Conference on Business Process Management (BPM'17). A. Armas Cervantes, N. van Beest, M. La Rosa, M. Dumas, S. Raboczi, Incremental and Interactive Business Process Model Repair in Apromore. In Proceedings of the Demo Track of the 15th International Conference on Business Process Management (BPM'17). F. Fornari, S. Gnesi, M. La Rosa, A. Polini, B. Re, G.O. Spagnolo, Checking Business Process Modeling Guidelines in Apromore. In Proceedings of the Demo Track of the 15th International Conference on Business Process Management (BPM'17). R. Conforti, A.Augusto, M. La Rosa, M. Dumas, L. Garcia-Banuelos, BPMN Miner 2.0: Discovering Hierarchical and Block-Structured BPMN Process Models. In Proceedings of the Demo Track of the 14th International Conference on Business Process Management (BPM'16). A. Armas-Cervantes, N.R.T.P. van Beest, Marlon Dumas, Luciano Garcia-Banuelos, Marcello La Rosa, Behavior-based process comparison in Apromore. 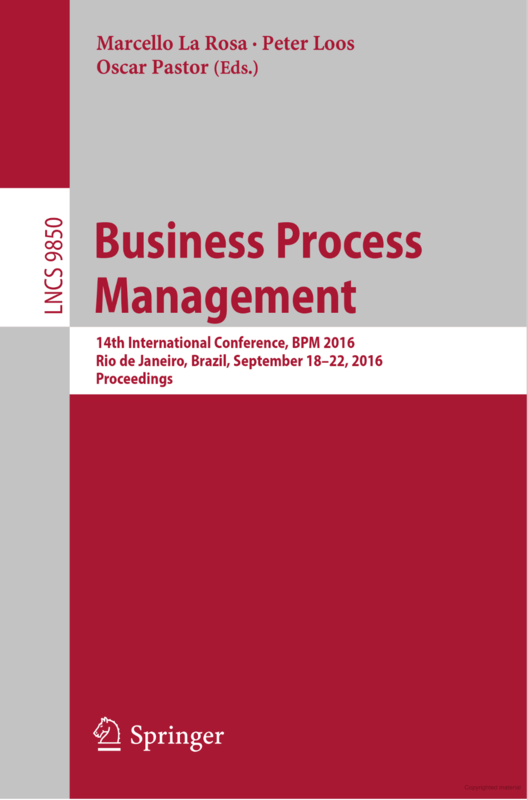 In Proceedings of the Demo Track of the 14th International Conference on Business Process Management (BPM'16). R. Conforti, M. Dumas, M. La Rosa, A. Maaradji, H. Nguyen, A. Ostovar, S. Raboczi, Analysis of Business Process Variants in Apromore. In Proceedings of the Demo Track of the 13th International Conference on Business Process Management (BPM'15). A. Polyvyanyy, L. Corno, R. Conforti, S. Raboczi, M. La Rosa, G. Fortino, Process Querying in Apromore. In Proceedings of the Demo Track of the 13th International Conference on Business Process Management (BPM'15). C. Ekanayake, F. Mannhardt, L. Garcia-Banuelos, M. La Rosa, M. Dumas, A.H.M. ter Hofstede. Detecting approximate clones in process model repositories with Apromore. In Proceedings of the Demo Track of the 10th International Conference on Business Process Management (BPM'12). M.C. Fauvet, M. La Rosa, M. Sadegh, A. Alshareef, R.M. Dijkman, L. Garcıa-Banuelos, H.A. Reijers, W.M.P. van der Aalst, M. Dumas, J. Mendling, Managing process model collections with AProMoRe. In Proocedings of the Demo Track of the 8th International Conference on Service Oriented Computing (ICSOC'10). LNCS 6470, pp. 700–702, Springer, 2010. M. La Rosa, F. Gottschalk, Synergia - Comprehensive Tool Support for Configurable Process Models. In Proceedings of the Demo Track of the 7th International Conference on Business Process Management (BPM'09). Vol. 489, CEUR, 2009. M. Adams, S. Clemens, M. La Rosa and A.H.M. ter Hofstede, YAWL: Power through Patterns. In Proceedings of the Demo Track of the 7th International Conference on Business Process Management (BPM'09). Vol. 489, CEUR, 2009. J. Recker, M. La Rosa, BPM Technology Research - the Case of Apromore, BPTrends Columns, 4 September 2012. M. La Rosa, M. Dumas, Configurable Process Models: How To Adopt Standard Practices In Your How Way?, BPTrends Newsletter, 4 November 2008. C. Ouyang, M. La Rosa, G. Redding and J. Prestedge, Applying YAWL for the Automated Execution of Film Production Processes, YAWL White Paper, 2007. R. Conforti, A.H.M. ter Hofstede, M. La Rosa, M.J. Adams. Automated Risk Mitigation in Business Processes (extended version). QUT ePrints 49331, 2012. S. Migliorini, M. Gambini, M. La Rosa and A.H.M. ter Hofstede. Pattern-Based Evaluation of Scientific Workflow Management Systems. QUT ePrints 39935, 2011. J. Mendling, M. La Rosa, A.H.M. ter Hoftede. Correctness of Business Process Models with Roles and Objects, QUT ePrints 13845, 2008.